Bed Linens Etc - Bed Decor, Coupon, Product Reviews, Factory Direct to Your Home!! ​Just as a phone protector stands as a shield for your expensive Smartphone, a waterproof mattress protector is similarly as important for a waterproof mattress. There are certainly many reasons why it’s a great idea to have this protective guard. Some people may be wondering why it’s even necessary to have the best mattress topper over waterproof bedding. Yes, the mattress may be waterproof, but it doesn’t prevent it from other forms of damage. Below are the main benefits of having a protector over your mattress. ​Well, this is an obvious benefit, isn’t it? With a mattress protector, you don’t have to worry about accidental spills on the mattress. Sometimes it can be very frustrating to have to wipe off liquid stains from your mattress. But a protector will make things easier. Most mattress protectors have good materials that easily wash off. They are machine washable and can withstand certain levels of stains. Bear in mind that human bodies are quite gross. There is a huge impact on the mattress from makeup, oily skin, shedding of skin, and sweat. At the receiving end of it is the mattress. But with a protector, the mattress will be clean as all stains will be deposited on the protector. Remember that mattresses are quite porous, and some of these skin cells can hide almost forever. Interestingly, you can prevent this with a good waterproof mattress protector. It shields the mattress and it’s very easy to wash.
​Overtime mattresses, no matter how durable they are, will wear down. Perspiration and other forms of moisture is usually the major culprit to here. You just can’t prevent this from happening, except using a protector. With the waterproof mattress protector, the lifespan of the mattress surely increases. It takes in all the seat and dirt your mattress would have suffered for. This leaves you with an almost new mattress for a long time. There’s no doubt that it helps you keep the mattress at an optimum condition. You get to avoid changing mattress more often, which saves you money in the long run. At least you can afford to change the protector as often as you like because they are not expensive when you compare with a mattress. ​For those who are in search of mattress toppers to upgrade the comfort level of their existing mattress, they may look for the mattress topper for back pain that supports the natural posture and keeps the sweating issue in control. ​As long as people make use of a mattress, there’s bound to be dust mites. These tiny little creatures cannot be seen with ordinary eyes. They even look small under a microscope. And they are everywhere. Those with dust mite allergies can feel very uncomfortable. It causes shortness of breath, wheezing, runny nose, and sneezing. These little creatures will always be on your mattress since it is very porous. The effect is even worse for babies and kids sleeping on the mattress. But with a protector, you can always pull out the protector to get rid of the mites. It will be more difficult to do when you don’t have a protector. ​If you want to protect the warranty you have on a waterproof mattress, a protector is definitely a necessity. When there is an accidental stain on your mattress, it will most certainly void the warranty. With a mattress protector, you can prevent this from happening. Most warranty will be void when your mattress is stained. You can keep your warranty still valid when you protect the mattress from such stains. The waterproof mattress protector is apparently something you need to consider when you want to keep your mattress at an optimum condition. It’s also important for health reasons. Those with allergies can significantly reduce their allergies to dust mites. Plus, it will reduce the number of times you have to clean up the mattress. All you have to do is roll out the protector and wash, which is quite easy to do. Some even add more comfort to your mattress. Moreover, mattress protectors are not expensive. You can afford to change them easily when they wear out. Unfortunately, that is not the case with mattresses. They may seem not too relevant, but these benefits make them important additions to your sleeping tools you simply can’t overlook. If you are considering buying a protector for your mattress, we are sure you now have more reasons to do so. And if you need to find out how you are going to find the best waterproof mattress protector, the following are some useful tips to help you out in a better way. ​Surely, there are benefits of having a waterproof mattress protector on a mattress. But it’s very important to select the right type. This will ensure you and your family enjoy its maximum benefits. Whether you are looking to buy a new mattress protector or replace an old one, these tips below will help you choose the right one. ​Polyester, cotton, polyurethane, and vinyl are the most common materials used for mattress protector. So, which one is more ideal for the family? Let’s find out their differences. Cotton is usually smooth and soft, which is why they are most commonly used in the textile industry. However, cotton is highly absorbent. In this case, it will require a waterproof backing in order to work fine as a protector. When it comes to absorbance, polyester is less absorbent than cotton. It keeps liquid out, compared to other fabrics. This material can be made to have different levels of feels. Some are made soft while others are made soft. But what you are definitely going to get from polyester is the high level of breathability. Vinyl, on the other hand, has a strong waterproof feature. This surely blends well with your waterproof mattress. Cleaning this fabric is also very easy. But there’s a question mark about vinyl. Many of them have phthalates, which is a major source of health concern for all. Polyurethane is the most common material used for waterproofing. It can be thermally attached or laminated to hold it to the material. This is a very good option if you are looking for a waterproof protector that can complement with the waterproof mattress. Which material is the best for a waterproof mattress? ​From the explanations above, it’s obvious that polyurethane and polyester fabrics are the most suitable as a mattress protector. They are completely waterproof and can be designed to be smooth and soft. ​As you are considering the best protector to buy, it’s important to consider how easy it will be to clean. Some fabrics are easier to clean and maintain than others. The ideal mattress protector should have a protective shield against spills. It should be very easy to wipe off spills and liquid stains from the protector. Again, vinyl and polyurethane materials come top for this feature. ​If you are buying the protector for your mattress, it will be ideal to select a product that doesn’t offer stiffness and noisy sounds. When your kid rolls on the mattress, the protector should be able to stay relatively soft and easy while giving support. Materials like blended synthetic and cotton are quieter than other types of materials. Mostly when you are looking for a mattress topper to be used on the mattress for back pain, support and comfort along with breathability are few of the priorities you must look for. How breathable is the fabric? ​If you are worried about breathability, materials like blended synthetics or rayon will be more ideal as a mattress protector. These do not produce manufacturing smell as much as other materials. ​Comfort levels of the best mattress topper can be determined by its level of thickness and support that it provides. Obviously, a protector that is too thick may not provide the required level of comfort for you and your family. A thin fabric will not affect the comfort levels the mattress provides. But in some cases, a thick protector can add to the comfort levels rather than diminish it. This is possible where the mattress does not provide the right levels of comfort for you. So, the final decision should depend on the type of mattress you have. In addition, some materials actually aid comfort by promoting cooling and preventing heat retention. This is where polyurethane material may not be a great option. For this cooling effect, cotton fabrics are usually the best. ​If you are buying the mattress protector for the first time, this may be a good way to avoid bad products. Even after research, some people may still buy the wrong mattress protector. Most top quality models usually provide warranties for a few years. You can check this out before paying for the product. If not for anything, at least the warranty provides a certain level of assurance and durability. ​A waterproof mattress protector may not be the most important thing when looking for the right type of bedding without any special comfort and safety features. But if you want the best comfort for your family, it should be considered as an important necessity. Apart from its job of protecting the mattress, it can add some level of comfort. As you can find mattress topper for back pain and specialized mattress topper for side sleepers to add extra comfort and safety features on your mattress. Now we can surely say that having a waterproof mattress protector is a must-have when you have kids at home or even if you need complete protection against spills and moisture. These tips will surely help you determine which waterproof mattress protector will be perfect for the overall comfort of your family. Leave a Comment on Do you really need a waterproof mattress protector? ​All camper knows the importance of choosing the best mattress for camping. After all, your choice of mattress can determine how well you will sleep at night. But when it comes to selecting the right camping mattress, there is more to comfort than you think. You bought a camping mattress and used it on your yearly camping trip. But as it turns out, the cheap camping mattress you purchased is no good. It is too thin and does not give your body the support that it needs. It also does not offer adequate protection from the stones and other blunt objects in the ground. As a result, you ended up not sleeping the entire night. The next day, you feel groggy. In fact, you are too tired to push through with the activities that you have planned for the day. Moreover, you feel aches and pains all over your body. ​Because of a simple buying mistake, you were not able to make the most out of what should have been the most wonderful camping trip of your life. ​You would not want that, right? Well, I don’t want that to happen to you too, and that is why I have created this comprehensive buying guide to help you find the best mattress for camping in the market. 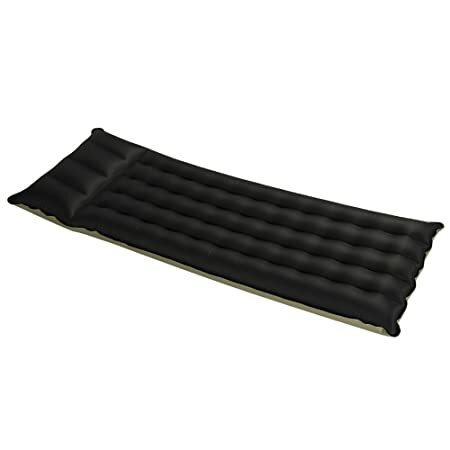 The air mattress features a rounded rectangular shape. What makes this air mattress special is its company’s patented ComfortCoil Technology. The mattress has 40 I-Beam air coils which ensure that the mattress will stay inflated throughout the night. ​The mattress also has a double height form factor which makes it easy for the user to get in and out of the bed. Because of this, it is recommended for people with back and knee problems. ​It has multiple layers of eco-friendly PVC material that is resistant to punctures. At the top of the mattress, you can find a waterproof and extra-thick material which makes it more comfortable. The bottom part of the mattress features a SureGrip coating which ensures that unwanted sliding can be prevented. ​The mattress comes with a carry bag for easy transport. For your information, the mattress comes with a battery-operated one-click internal pump for easy inflation and deflation. According to most users, the mattress reaches its full firmness and inflation within just 3 minutes. Considering it is an air mattress, you will be surprised to know that you can buy it in just less than $100. Now, that’s a steal! Even if this mattress is affordably priced, it comes with a reasonable warranty period of one year. 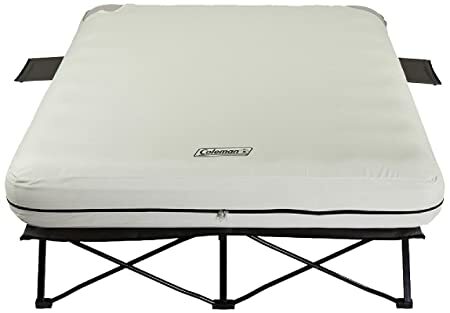 This is another air mattress with a rounded rectangular shape that features the Lightspeed’s patented stabilizer system. This system allows the user to adjust the firmness of the mattress. ​Aside from the adjustable firmness features, the stabilizing system also helps to evenly distribute your weight and keep your spine in proper alignment. ​The mattress is made up of PVC-free TPU material which has lots of amazing features. The material is temperature stable, durable, and abrasion resistant. It also does not give off any plastic odors like most mattresses. ​This eye-catching mattress comes with an equally bright, stylish and roomy storage bag. The mattress has a single cap valve for fast and easy inflation and deflation. It comes with a battery-operated pump (batteries not included). Considering that the mattress is just for two people, we can say that this mattress is pretty expensive. But with the quality of material used in making this product, I would say it is well worth it. Just like most camping mattresses, this mattress also come with a 1-year limited warranty. This is the most versatile mattress in the list just because the product is a cot with a thick and comfortable mattress on top. This product combines the best of both worlds. It features the isolation you would want in a camping cot or stretcher, but at the same time, it offers the comfort that camping mattresses offer. ​Just like our first product, it also has a coil system called ComfortStrong which promotes the support and comfort of the mattress. Additionally, the mattress has an AirTight System with a double lock valve which prevents the air in the mattress from leaking. ​The cot is supported by a sturdy steel frame that has a high maximum weight capacity. It can support a weight of 300 pounds and accommodate the height of up to 6 feet tall. ​Another unique feature of the product is it has two side tables with cup holders for convenience. Just like most air beds, this also comes with a pump. Its pump is battery operated and can inflate the mattress without any need for electricity. It is much pricier than most mattresses in the list, but that is to be expected since this product comes not just with a mattress but sturdy steel frame as well. There are no warranty details provided in the company’s website. But given the fact that Coleman is one reputable company, it is most likely that they are offering warranty for their products. To know more about it, you should contact their customer service representatives. Claimed as a luxury self-inflating mattress, the mattress offers superior warmth and comfort to the user during the colder months. The mattress has a polyurethane foam at its core, 75D polyester at the bottom, and 75D reverse diamond polyester at the top. These materials, when combined together, create a warm and cozy sleeping space. ​For a spacious sleeping space, the vertical sidewalls of the mattress can extend the width of the mattress by 20%. ​The mattress comes with a stuff sack with a carry handle for portability. Well, this might have the easiest inflation process of all the mattresses. After all, it is a self-inflating mattress. When the mattress is unpacked, the dual valves permit the core to expand and inflate. You can easily adjust the firmness by blowing a few breaths into it. 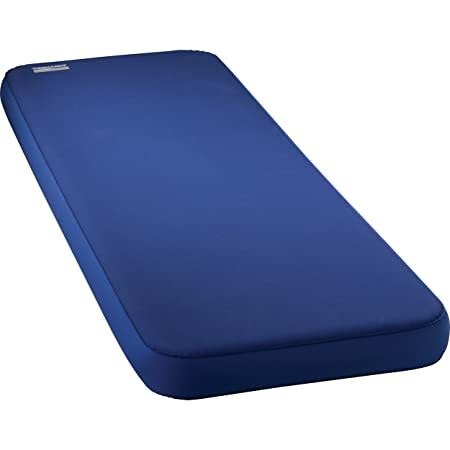 ​According to the manufacturer, the foam self-deflates too but as per some reviews, the user has to sit atop the mattress to release the air inside it. This camping mattress is the most expensive product on the list. However, this does not come as a surprise as it has the easiest inflation process as well as the biggest surface area among all the products. Let us also not forget about its heating abilities. This lightweight mattress features a wave beam construction to distribute the body weight of the user evenly and at the same time, offer a comfortable sleeping experience. To maximize its comfort factor, the manufacturers topped the mattress with fabric. ​As if that’s not enough, they also coated the mattress with laminated vinyl to protect it from environmental elements. Lastly, the mattress has a built-in pillow for convenience. Given the fact that this is a no-frills small camping mattress, it is expected that the mattress will be very cheap. Oh, it is, all right! The mattress needs a pump to be inflated. However, the mattress does not come with a pump, so it is up to you to buy one. Since the mattress is not as thick or as big as other mattresses, the inflation process will be swift and easy. Sadly though, there is no provided warranty information. It is best that you talk with their customer service representative to know more about it. ​You will be amazed to know that camping mattresses actually come in different types. In general, there are three types that you should know about. Each of which come with their pros and cons that you should be familiar about. These are commonly called 4WD inflating mattresses and has become widely popular due to ease of its installation. This type of mattress is liked by many due to its low price and durability. ​From its name, these mattresses are capable of self-inflation. This feature is supported by valves located at the bottom part of the mattress. As you roll the mattress, the air inside is pushed towards the valves. Because of this, the mattress, when placed in a horizontal position, the valves open and the mattress self-inflates. ​However, the rolling process is not as easy as companies claim it will be. Additionally, the mattresses are heavier and bulkier than most of its counterparts. Are you camping with a caravan? If that is the case, space will not be an issue for you, so there is no need for you to choose a camping mattress that is foldable or inflatable. ​Instead, the best option for you would be the foam mattress. These pads are made of high-density foam which provides better cushioning and keeps you feeling comfortable all night long. But to enjoy these benefits, you have to choose a mattress that is thick enough. ​It is also easy to put in place as you need to roll it out and you are good to go. This type of mattress is also known for its low price. ​However, foam pads are not foldable. You can fold it in half, but that’s how good it is going to get. Additionally, they take too much space. Also known as blow-up mattresses, these are the best options that you have if you are dealing with limited space. This mattress requires to be inflated, but unlike the self-inflated ones, it only has one valve and must be inflated manually. This is why most air mattresses come with an air pump. ​Air mattresses are known for their affordability and high compressibility which makes it an excellent option for backpacking. ​However, it is prone to leakage. It is also not suitable for rocky and stony surfaces as they can easily be punctured. There are camping beds that are composed of a mat that is held up by two aluminum frames. This is the fastest and cheapest option that you have. Additionally, this can become highly useful when you wanted to be isolated from the ground due to wet grounds, low temperatures, and muddy terrains. ​However, it is not the most comfortable option that you have because it lacks a foamy surface. Most people tend to disregard the importance of mattress height. You need to bear in mind that the air inside the mattress acts as insulation between your body and the ground. ​If you want to buy a mattress that can withstand all types of weather and terrain, a higher mattress is the best option for you. After all, the higher the mattress, the more isolated you will be. ​During the summer season, you won’t feel as hot, and you won’t feel as cold during the winter season. Also, higher mattresses are great for older people or people who are struggling with getting out of bed. If you want an easy deflation and inflation process, then you should go for the self-inflated mattress. ​But if you are planning to go for the air mattress, then the inflation and deflation process would be of paramount importance for you. ​If you are buying a single-sized mattress, you can blow the mattress up without the use of a pump. But if it is bigger than that, then using a pump is in order. Sadly though, most pumps need an electrical source to properly work. If this will be a problem for you, then you should go for battery-operated ones so you can pump the mattress without any hassles. The challenge does not stop after you have inflated the mattress. The challenge continues because you need to make sure that the bed has to stay inflated. ​As you see, mattresses spread or shrink depending on the changes in temperature. Sadly, the temperature at night is not constant so the cushion may get deflated at any point in the night. ​To prevent this, you must buy a camping mattress with inflation control system. This technology measures the pressure inside the mattress. If there are any changes in the pressure, the system works to compensate. If the mattress does not come with this system, the least that you can do is to make sure that the valves are tightly sealed so it can prevent temperature deflation and air leaks. The main factor to consider would be how the mattress supports your body. With that in mind, it is essential that the bed helps to distribute the weight of the body evenly. ​For this, you would want a mattress with a well-distributed net of air coils as these chambers can boost the comfort factor of the mattress. However, this can be expensive. If you do not have the money and you are only going for a single-sized mattress, then you can forego this feature. ​But if you are looking for a double mattress, this must be a non-negotiable factor for you. I know that camping is not an easy physical activity. You will be required to carry your own stuff up to the camping site. The journey to the site may be a bit bumpy and challenging, so you must make sure that your stuff will not be too heavy or too big for you to handle. This is most especially true if you do not have enough space in your rig. ​Lucky for you, most of the companies state the packed size and weight of their products so you may want to check out that first before making a final decision. If you are a person on the heavy side, then you should make sure that the maximum weight capacity of the mattress is suitable for you. Since you will be using the mattress in the outdoors (I know that there is a shade and everything but the mattress will be in close contact with the ground), it is most likely that the bed will get punctured or spring a leak. ​Because of this, it is vital that you make sure that the mattress is durable enough to withstand all that. To make sure of that, you should check out the denier ratings of the mattress. ​The denier ratings of camping mattresses range from 50D to 150D with the highest being the most resistance to tear. ​In addition to the Denier rating, you should also need to consider the thickness of the fabric in the bottom part of the mattress, The thicker this fabric is, the better. As you know, most people would go for a mattress that is self-inflating, and that is why most mattresses that you can find in the market are self-inflating and come with a twist valve. ​Because of this, you must ensure that the valves of your mattress will be of high quality. However, as per customer reviews, not all valves are created equal. Some are flimsier while others are sturdier, so you need to take a look at this part when buying a mattress. You should always ensure that your purchases are covered by a warranty. However, you should take note of the fact that the duration of the warranty may vary from one brand to another. The least duration of warranty that is acceptable is one year. If the mattress comes with a pump, it is best that the pump should be covered by a warranty too. Of course, let us not forget about the fact that you will be lying down on the mattress so you must make sure that the length and width of the mattress can accommodate the built of your body. ​You should also consider the way you sleep. If you tend to turn and toss at night, it is recommended that you go for a wider mattress even if you are a bit on the thin side. ​Aside from your built and sleeping habits, you may also want to consider the size of your tent. ​​I know there are a lot of things that you should know when it comes to buying a camping mattress. I hope this section will answer any more questions that you may have. 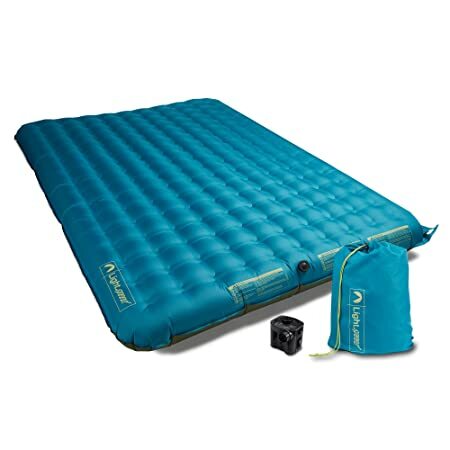 ​• What are the other features I should look for in a camping mattress? Some models can connect to another mattress. This is a lot more convenient and flexible than buying a larger sized mattress. After all, you can carry each mattress separately then link each other together so you can have a bigger sleeping space. Using a separate pillow can be a bit of a hassle. After all, it will add an extra burden to you as you walk to the camping site. Moreover, it tends to slip or slide around while you are sleeping. ​Most models come with a built-in pillow which will always stay in place and inflate along with the mattress. If you plan to camp during the colder season, this feature is a must for you as it can protect you from the coldness of the ground. ​• What are the types of mattress pumps? ​Well, there are three. The first one is the electric pump which is the fastest and easiest option to inflate the mattress. However, the downside is, you may need an electrical source to make it work. The second option is the battery-powered one. This pumps the mattress smoothly and quickly without any need for an electrical outlet. However, this type of pump is heavier and bulkier than most. ​The last one is the hand or foot pump. This pump uses pressure generated by either your hand or foot to inflate the mattress. This type of pump is small and portable and would not require battery or electricity to function. However, it would require physical effort. ​Which is the Best Mattress for Camping? ​As you may have noticed, the characteristics of the camping mattresses in this list are different from one another. That is why it can be difficult for you to choose which is the best mattress for camping. ​But upon further consideration, I have come up with three different options—one for each purpose. 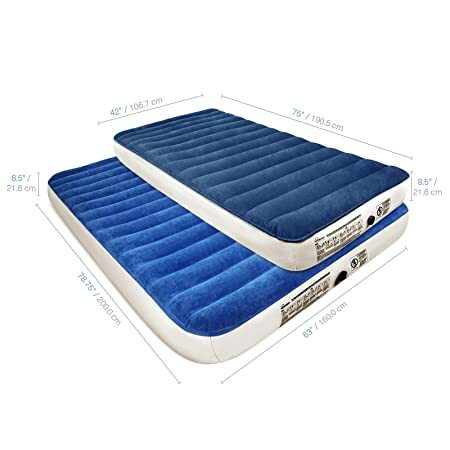 ​If you are a single camper and you have lots of stuff to bring with you, the best option that you have is the Intex Inflatable Camping Mattress. However, it can be quite uncomfortable, so this is only recommended if you plan to stay only one night. ​If you are a combination sleeper and you plan to camp during the colder season, then the Therm-a-Rest MondoKing camping mattress is your best bet. ​But if you want a comfortable and lightweight mattress, I recommend that you go for the SoundAsleep Camping Mattress. Does your bedtime vary widely from one night to the next? Do you randomly wake up in the middle of the night and find it difficult to go back to sleep? Are you always tired when you wake up? Is it always a struggle to wake up at the right time? and waking up at the right time. If you exhibit the above signs then it may be an indication of depression ora sign of sleep disorder. This doesn’t have to be the case though. You have an internal clock which is also known as circadian rhythm that is actually built to allow you to fall asleep at a similar time each night so you can wake up at a predictable time feeling refreshed and energized. What causes fluctuations in your sleep pattern? When you have a few late nights, it can really affect your biological rhythm. This makes it very important to ensure that you get your sleep cycle back on track. What are the effects of having an uneven sleeping pattern? Chronic exhaustion which can make you feel like you are in a state of constant jet lag. It can cause or contribute to a number of ailments such as obesity, diabetes, and cardiovascular diseases. It is possible to be rested and be productive everyday without the need for an alarm clock. All you will need to achieve this is adopting clean sleeping habits and getting yourself on a new sleep schedule that you will follow. It is important to ensure that your sleeping environment is comfortable enough to support peaceful sleep. The light in the room should be as low as possible in your bedroom. Get curtains that block light and get rid of alarm clocks that emit light, as well as cell phones. You should reduce the temperature in your bedroom to a degree comfortable to sleep in. What you do during the day will greatly affect your sleep quality. Sometimes making modifications to your daytime activities can be all you need to fix your sleeping schedule. The most significant sleep inhibitor is the intake of coffee. You should make an effort to avoid the intake of caffeine as much as possible up to 6 hours before bedtime. Exercising during the day can also go a long way in helping you fall asleep faster at night. Exercising or working outwill help to tire you enough for deep sleep. Use relaxation techniques to manage stress levels during the day to help you to get the much needed sleep at night. These techniques include breathing exercises, yoga, or other stress relieving techniques.A peaceful state of mind during the daycanbe carried all the way to bedtime. Exposing yourself to electronic devices and LED lights at night may actually interfere with your internal clock, sleep hormone secretion, and the quality of sleep.You should consider replacing the light bulbs in your bedroom with none LED bulbs and read ‘real’ books instead of eBooks. When you take these steps to reduce your exposure to brightly lit devices you can immensely increase your ability to fall asleep on time. You should always remember to keep most of your evening activities out of bed. This will help your subconscious link your bed with a state of relaxation and sleep. It’s important to ensure that you also eat at least 2 hours before you go to bed. The action of eating and digestion can make your body go into an active mode which is not healthy for your sleep cycle. Setting up the ultimate sleep routine is vital and it entails setting up a sequence of events to repeat every night. Some of the best practices include putting away all electronic devices at least an hour before bed and then engaging in relaxing activities such as yoga or meditation. You should avoid eating just before you go to bed, but can have some warm milk to help your body unwind. Engage in a normal bedtime activity such as reading a few pages of your favorite book or writing in your journal to help you relax. When you get sleepy please turn off your lights and try to fall asleep as calmly as possible. Do not stress yourself if you cannot fall asleep after 20 or 30 minutes, just get up and continue with your relaxing activity and sleep will come. Resetting your sleep schedule will not occur in one night. You may struggle for the first few nights but then your internal clock will get with the routine and everything will flow smoothly after that. We all love a good night’s sleep and wake up when we are fresh and stronger the following day. One of the tools we have to help us achieve this sleeping goal is a good pillow. In addition, it is the hope and wish of every responsible parent to see their kids enjoying the same benefits of restful sleep as they cruise through dreamland. However, the same tools we want to help our kids to use in improving their sleep can turn out to be disastrous to the life of your most important treasures. The reason why pillows can become a source of pain to a family is the possibility of pillow suffocation among kids. The sad truth is that suffocation can be a potential risk among babies unless you take necessary steps to prevent it. According to Healthy Children, pillows can suffocate children, especially when they are not old enough to move properly in their beds to stop the pillow from sticking over their mouths and noses. If you want to keep your child safe, it is necessary to introduce the pillow at the most appropriate age. In addition, many child pillow safety experts also recommend paying attention to the size and overall feel of the pillow as some of the ways of preventing pillow suffocation. In our discourse, we shall dig deep into the dangers that lie in ordinary pillows, how and why anti-suffocation pillows are ideal for normal kids and those suffering from seizures, and when it is most appropriate to introduce pillows. If you want to learn more about pillow-based suffocation, then you will need to remain with our post up to the end. Ordinary Pillows: Where is the Risk? Why are ordinary pillows risky for kids to use? These pillows pose a threat of suffocation because they can block the baby’s mouth and stop the free flow of air into and out of its lungs. Besides causing death, the loss of oxygen for a few minutes can lead to the potential death of the child’s brain. Worse still, a young one is more vulnerable when they are suffering from seizures since they will not be conscious to try avoiding the danger. The risk reaches the peak if the child is taking medications that can suppress proper breathing they are more vulnerable to suffocation than when they are breathing normally. An ordinary pillow can be dangerous to a child because it can suffocate him or her. This can happen by when the child turns the face downwards and burying his or her face in the pillow or even the young one gets his or her head beneath the pillow. Even though this type of occurrence is not common among many kids, it is necessary to do what it takes to prevent it. Additionally, you ought to remember that a baby does not require a pillow to sleep well. Therefore, the lack of a pillow in the baby’s crib should not worry you. We have many deaths resulting from kids suffocating from these pillows because careless parents left them in these pillows alone. The reason is that they block the baby’s respiratory system. These pillows are not safe for a child to use since it is easy for the baby to suffocate if it gets trapped between the pillows two arms or beneath it. Therefore, it is needful to avoid them as tools for maintaining the body position of your sleeping infant. If you want to allow your baby to play in the pillow, it is prudent to move the baby from the pillow if you intend to move away. You will need to lift the baby out and place him or her on the floor, find another safer surface for them to play, or alternatively, you may move with the baby. Another way of preventing pillow suffocation among babies is using anti-suffocation pillows. But how does this pillow help to prevent baby suffocation? It works in a very simple way. The pillow surface has many foam ridges that permit air to circulate around and through the whole of it. Its foam nature makes it impossible for the pillow to wrap around the head of your child. These pillows are the best bet especially if your child is suffering from seizures because such kids are most vulnerable to suffocation. Since these pillows are crafted by hand from special soft foam that is also highly porous, it facilitates easy breathing compared to the ordinary ones. Additionally, they have an aero-cavity and through-channeling that work together. This partnership makes the pillow dynamic in its nature since any head movement your child makes causes air to pass from across the aero-cavity across the through channeling to pass around the head and assists in preventing suffocation. In as much as you would like to see your young one enjoy their sleep, it is necessary to understand when it is most appropriate to introduce a pillow. Even though a pillow is necessary in facilitating good sleep, you do not need to rush the process of introducing it. As long as the absence of a pillow does not affect your child’s sleep, it is important to delay introducing it until when the baby is somewhere between the age of 18 months and 8 years. In between here, you have a wider leeway to introduce the pillow slowly until the child is used to it. According to The Lullaby Trust, when you give your child a pillow before their first birthday, you expose him or her to SIDS (Sudden Infant Death Syndrome) two and a half times more than those babies who are not exposed to pillows at an early age. To keep your baby safe at this stage, you have to allow it to sleep freely in the cot without any pillow around. According to research on pillow safety for babies, pillows, alongside duvets and quilts, are the leading causes of SIDS in the United Kingdom. However, the researchers have not come up with conclusive and exact reasons why pillows lead to such suffocation in babies. But one thing they are emphatic about is that you when your baby attains the age of one year, it is up to you do give them a pillow. Pillows are great tools for facilitating good sleep among kids and adults alike. However, when they are not used properly and introduced at the right age among kids, they can lead to pillow suffocation. The reason is that children are the most vulnerable lot when it comes to suffocation that arises from pillows with kids under the age of one year being the most vulnerable. However, you can take the lead and prevent this type of suffocation among kids by ensuring that you introduce pillows at the right age. Additionally, you can use anti-suffocation pillows to prevent suffocation among babies. We believe that the insights we have shared in this post will raise your sense of enlightenment and responsibility so that you can take preventive measures to ensure that your child does not suffocate in a pillow.